Welcome one and all, Freshmen and Seniors of NTU! 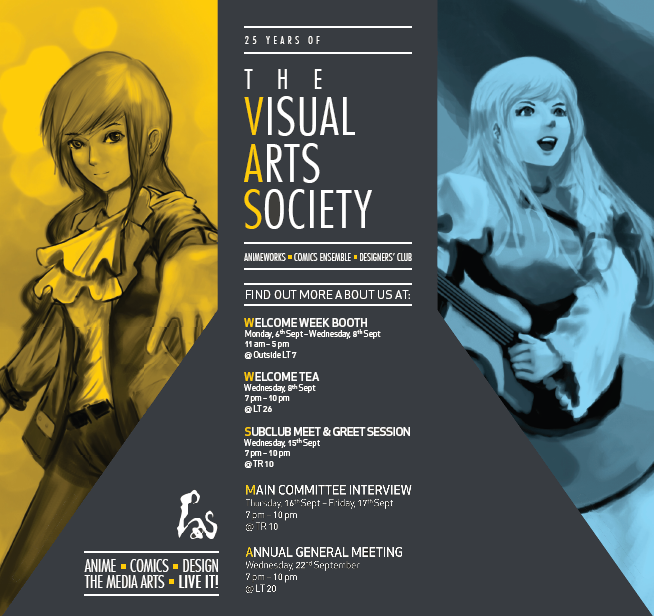 Another fun year passes, before we knew it, a brand new academic year is upon us, one with new possibilities and challenges ahead for the Visual Arts Society. Click on each event to find out more about them. We'll update the links as more information becomes available, so do check back here for updates!! Take a look and explore our website as well, you may find some of the answers you seek. But if you have a query that you are dying to get an answer to, feel free to contact us using the links provided on the right. To get e-mail updates from us, you can register your interest in our club through our registration form here. Or join our Facebook group here! Register your interest in Joining Our Club and Attending Our Events in these two separate forms.